Asuncion Our first successful contacts in Asuncion were with the Fundacion Paraguaya. After weeks of sending emails without answer and puzzling over our problems, Martin Burt, the Executive Director of the Fundacion immediately answered my email, and almost as quickly we were having a lengthy Skype call, and he was offering his help, including the support of his super-efficient assistant, Sarah Hopper. It turned out that Burt had a PhD in international relations from Tulane University in New Orleans and in his words was a “wannabe Cajun.” It’s a small world! 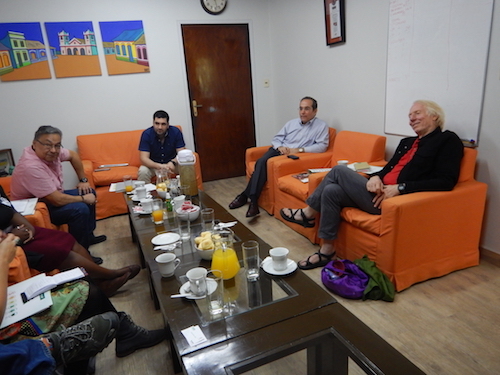 The Fundacion Paraguaya is a huge nonprofit though with a major footprint in Paraguay and operations in a number of countries in the world from the United Kingdom to the United States to Argentina and various countries in South America and Africa. The bulk of its $20 million annual budget, according to one of their 500 staff members, is its $16 million microfinance operation in Paraguay. 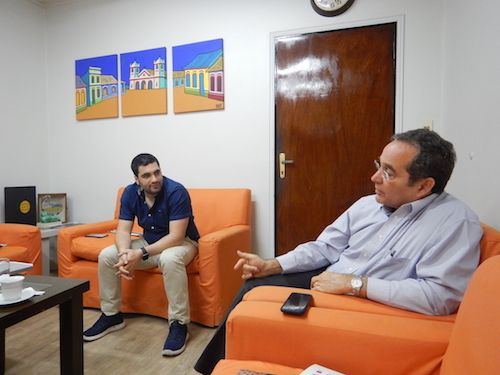 They also have integrated their operations into the Paraguayan educational system with social entrepreneurship programs in all 7000 schools in the country. They registered a charity in the United Kingdom which also specializes in such programs. When the Organizers’ Forum delegation met in the Fundacion’s offices most of our time was spent discussing a unique and interesting tool they had developed called the Poverty Stoplight. The Stoplight focuses on an effective and blunt survey method where families, usually accompanied by some representative of the Fundacion or one of their partners, assesses their own relationship to poverty across fifty indicators by choosing red, yellow or green on the stoplight for each question. A green assessment is a positive indicator of no problem, no poverty in that area, essentially. A yellow indicates progress in ameliorating the poverty indicator, and red is the signal for a significant poverty issue. The indicators are obviously not just financial, but include family violence, dental health, access to clean water, personal hygiene and sanitation systems, decent housing, and social capital, like knowing neighbors. The Stoplight is in use in upstate New York, Stockton, California, Newcastle, England, South Africa, and Nigeria among other countries through their work with their partners. Burt described the tool as allowing the “poor to own their own poverty,” meaning that it was a bottom-up assessment tool rather than a top down determination. He also argued that the tool led to action, though that was harder for the delegation to follow closely. The Fundacion argues that 80,000 people have used the tool with the bulk coming from their credit representatives interviewing families of the borrowers in their microfinance operations. With their microfinance clients they have determined the rate to “get out of poverty” is three times faster using the Stoplight. In some ways it seems the Stoplight is as effective as the partner’s ability to intervene depending on where the red lights are indicated. Though there was a claim that the Stoplight could trigger necessary collective action and organizing, the delegation generally had difficulty in connecting the dots to see how that might evolve from simple use of the diagnostic tool, but we were all intrigued by it. Martin Burt, unlike Mateo Balmelli, didn’t start the conversation by asking if we knew who he was, but at one point he mentioned something about having been mayor. Later we googled his resume to find that he had been Commerce Minister in one government, chief of staff to the President in another, and Mayor of Asuncion for a number of years before returning again to direct the Fundacion. From the awards and prizes he and the Fundacion have won in the social entrepreneur development world, they have clearing focused a bright beam from Paraguay to the rest of the world.